The downjet is designed to jet warm air right down to the floor. This reduces stratification and delivers more heat to the occupied zone for gas ducted systems. The airflow dampers are adjustable by turning the centre knob. Now rooms that are not in use can be shut off to conserve energy. Construction: All models are constructed from A.B.S polymers providing long term strength and rigidity. The A.B.S blend has a softening point well above that required for heating applications. 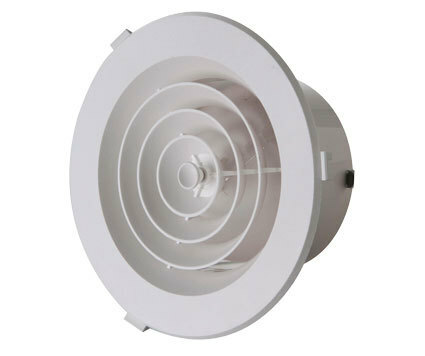 The diffusers consist of a series of concentric rings that deliver the air downwards at a slight angle to the vertical. The external exposed surfaces have an etched finish. A centre knob can be pushed and turned by hand to adjust an integrated butterfly flap. The flap impedes the airflow allowing individual control of airflow for an area. Total shut-off is possible.